Twelve-year-old Bea finds herself on a unique road-trip with her grandmother, as they search for her grandmother’s long-lost sister—the legendary Amelia Earhart—in this charming novel from the author of When Audrey Met Alice and Summer of Lost and Found. It’s 1967 and twelve-year-old Bea is in need of some adventure. Her mother is off in San Francisco, while her father has just gotten remarried in Los Angeles. Bea has gained a younger stepsister, and she’s not thrilled about her blended family. So when her ailing grandmother, Pidge, moves to an Orange County senior-living community and asks if Bea would spend the summer helping her get settled, Bea is happy for any excuse to get away. But it turns out, her grandmother isn’t interested in settling in. What she really wants is to hop a train back to Atchison, Kansas—where she thinks she’ll be reunited with her long-missing sister: Amelia Earhart. And she wants Bea to be her sidekick on this secret trip. With letters in hand, Bea and Pidge set off on their quest to find Amelia. But getting halfway across the country proves to be more of an adventure than either of them bargained for. And their search for Amelia leads to some surprising truths about their family—and each other. It was the happiest place on Earth, or at least it was supposed to be. But I was hot, sticky from spilled lemonade, and unable to dislodge the nervous pit in my stomach. The crowds undulated around me, full of laughter and smiles and felt-and-plastic mouse ears. My father actually whistled as we strolled the park, Julie’s arm hooked jauntily through his. Sally’s sweaty palm pressed against mine as she squeezed with eagerness. “I want to go to Tomorrowland! It’s brand-new!” Sally’s voice was high enough to squeak, which fit with the mouse ears she was wearing. I already had a pair, so I’d passed. And I didn’t like how Sally wanted to share everything with me—books and records and telephone calls and hairstyles. If I didn’t turn the flimsy little latch on my bedroom door at night, I might wake to find her curled up next to me with her head on half of my pillow, an arm hugging my old teddy bear. “It’s not really new,” I pointed out. “They just changed it up.” Twelve years after the park opened, I guess the park people thought they could do better—kind of like my dad with his renovated family. I tugged on my dress, which Julie had bought me. Somehow my stepmother had no problem selecting the right sizes for Sally, but this dress felt too short on me—and unfortunately it wasn’t supposed to be a miniskirt length. (Julie said I was too young for those—maybe when I turned thirteen.) The bell-bottomed pants she’d brought home the week before were inches too long. Both were covered in bright fashionable swirls that I wasn’t so sure about wearing, even if Julie insisted they were like something Twiggy wore in Vogue. Julie patted Sally’s shoulder. “It’s new to us,” she chirped. My father, still whistling, was oblivious. I stared at the sign ahead. TOMORROWLAND: WHERE THE DREAMS OF THE FUTURE ARE REALITY TODAY. I felt that sharpness in my stomach again. Didn’t any of these people get it? Sure, here the future looked exciting—with a PeopleMover train and clean white buildings and no litter on the street. Everybody singing along to show tunes and eating carnival food. But what about the world outside of amusement parks? What about all the war and disasters and terrible things to worry about? There is a reason why there are no newsstands in Disneyland: to keep it the happiest place on Earth. I let go of Sally’s sticky hand, and I watched my father and freshly minted stepmother and stepsister walk a few steps ahead of me. My dad swept Sally up onto his shoulders so she could see above the crowds. Julie grinned up at them. I blinked hard. The three of them together was an echo of the only time I’d been to the park before: with my mom and dad, on my seventh birthday. We’d studied the park map and danced in New Orleans Square and laughed for the whole day, at least that’s how I remember it. I had watched them stitch our names into three matching pairs of black felt ears—Ken, Sheila, and Beatrice—like we were permanent. Back then, I thought that my family would always be together and that the world was a place you could understand, that there were some things you could count on no matter what, like your parents being in the same home to tuck you in at night. When I thought about how things had changed since the last time I had been there, I had to wonder what else would be different the next time I came to the park. Or even when I got home. Disneyland was a pit stop on the way to the house of a grandmother I had mostly met through birthday cards and calls on Christmas. I would be spending two weeks there, and suddenly that seemed like a very long time, even though it had been my idea to go. I started to get that panicked feeling again: as though the world were spinning like the Flying Dutchman at the playground, or as though the air had suddenly gotten thin. It had troubled me all spring, whenever a scary news report came on air, whenever my mother left town—and especially when my father remarried and Julie and Sally moved into our house. Now the spinning feeling was back, while amusement park cheer surrounded me at Disneyland. And it wasn’t because I was on a ride. I wished I had my journal with me, but it was in my suitcase, in the trunk. I rubbed my free palm along the hem of my dress. It doesn’t fit me, and I don’t fit this new family. I didn’t want to go into Tomorrowland and be fooled by its promise. I wanted to dig my heels into the paved walkway and stand still, to stay in the now. Or better yet, I wanted go back. Here that’s actually possible. I was in one of the few places in the world where you could actually stop time, by turning a corner and entering the past—or at least a pretty good imitation of it. I took a step backward and the crowds closed in, dropping like a curtain between my family and me. Craning my neck and standing on my tiptoes, I couldn’t see a flash of Sally’s matching fabric anywhere. They were gone, off into the future. I took another step back, moving away from the gleaming white structures and toward knotty old wooden ones. It was almost an hour later when my father, red-faced and huffing, found me cross-legged on a grassy spot of Tom Sawyer Island. The breeze ruffled my hair and I felt as calm as I had in a while, which was odd because normally being separated from my family at an amusement park would terrify me. Because of the too-shortness of my dress, grass clung to the backs of my legs when I shifted them to a more proper position as he hustled down the path in my direction. Julie trailed behind him with Sally. My father wiped the perspiration off his brow, then rubbed absentmindedly at his beard. That was a change too—he had been clean-shaven my whole childhood, up until he met Julie. It’s like as soon as he and my mother divorced, he had to shed everything about our old life—except me—and then add facial hair. “I’m sorry . . . I got lost.” Which was both true and untrue. I had felt lost. “Well, come on. We have only a few hours left, and Julie thought we should eat at the Blue Bayou. After the Pirates of the Caribbean—Sally’s been begging for that, haven’t you?” He ruffled her hair, like he always used to do to mine, and I felt a pang of something like envy, even if I was too old for stuff like that. Sally darted over to me. “Be-ah!” That’s what she calls me, no matter how many times I tell her it’s “Bee, like when you say ‘the Beatles.’ ” A huge grin stretched her tearstained cheeks. “We found you!” Despite myself, I smiled: Sally seemed genuinely distraught by my running off. “Now can we go get in the line?” Or maybe she was simply mad about missing time on the rides. I wanted to stay on that fake adventure island, which, ironically, felt like a very safe place to be. But I let my dad grab my hand and pull me up. I think we were both surprised that I had wandered off in the first place. I’m not adventurous and independent like my mother. It’s just—in that sea of happy people in that fantasy world, I felt like the only one who could still spot the trash cans and utility poles. And nothing made me feel more alone, and unsure. It was after Sally and I got into another fight—this time over some of my old paper dolls that she had found in my closet and colored on—that I decided to stay with my grandmother, Muriel, out in Sun City. My father had walked into the TV room and Julie had followed slightly behind him, like she wasn’t sure if she should be part of the conversation. They were interrupting an episode of Lassie. “But I’m spending next week with my mom.” I had been counting down the days until I could head over to her bungalow, although I would need to devise some way to make sure Sally stayed out of my room while I was gone. I kept my eyes glued to the screen, but I could still sense the look my dad and Julie exchanged. My mother is a writer. When I was small, she started writing little things for the newspaper—like household tips and recipes for new casseroles and the latest in home fashions. Then her friend from college, who had a job at Look magazine, gave her a few bigger stories—no more serving suggestions involving salads in hollowed-out watermelons. Around the time my parents split up, she started reporting on the really big things, like the Watts riots and troops going to Vietnam. In January, she’d traveled up to San Francisco to report on the “Human Be-In,” when a bunch of hippies gathered in Golden Gate Park to . . . I wasn’t really sure what they were doing. But now that it was summer, even more young people were flocking there to spread love and music and who knows what else, so my mother went back to witness the “Summer of Love,” as people were calling it. Mom had been supposed to come home that week. Even though I was hardly the only one of my friends whose parents had divorced, in most cases both of their parents were still around. Their mothers packed lunches and set out trays of deviled eggs as a snack when you went over to study after school. Their dads drove over on the weekend and whisked them away to go to the movies or to the beach. My mom flitted around the country with a notebook. When she was home in California, she spent as little time as possible in the tiny bungalow she rented in the nearby hills. I got it that she didn’t want to hang around the suburbs, but I still wondered sometimes—didn’t she miss me? Anyway, sitting there and not watching Lassie save the day, I thought about my options. I could stay at my house, which was no longer just mine and Dad’s but also Julie’s and Sally’s. I could watch my stepmother and father coo at each other and my stepsister systematically take over the whole space. She was like the invading armies they talked about on the news. Nothing was off-limits—not even my pajamas. One night I wandered into the bathroom and found Sally brushing her teeth in my favorite pair. I was surprised she wasn’t using my toothbrush, too. Or my other option: go stay in an old-folks’ community with a grandmother I barely knew. The next two weeks would be lonely, anyway, in Burbank—my best friend, Barbara, was already off at summer camp in the mountains. (I was too afraid of bears and wildcats to join her.) I didn’t know what Sun City had to offer, other than no stepsisters constantly in your personal space. The only risk was boredom. My mother always said that she wanted to go wherever the stories took her, although mostly she just went wherever Look magazine sent her. “Life is so short, Bea,” she’d said. “And yet there’s so much to experience in it.” Visiting my grandmother’s house wouldn’t be an adventure. But it was at least an experience. I liked the idea of being able to tell my mom all about it when we were together again, instead of only being able to recount what had happened on The Doctors, Julie’s favorite soap opera, which I could overhear even when I was reading in my bedroom. Julie’s smile stretched so wide, I thought it might split her pretty face. “That is so kind of you, Beatrice.” She retreated into the kitchen, humming, and I resisted the urge to stick my tongue out at her back. The only person who seemed sad that I decided to go was Sally, who grabbed onto my leg and swore she wouldn’t let me leave. It felt like I’d grown a barnacle. Later on, in my room, I looked around and wondered if I’d made a terrible mistake. I love my room. It’s full of bookshelves and a big desk, and the Beatles poster that Barbara gave me for my last birthday and all kinds of magazine pages are tacked to the walls: articles that my mom wrote, and photos that I thought were cool, of people and places all over the world. That makes the walls excellent inspiration for daydreaming. My room was my space, and sometimes the only place that seemed predictable anymore (so long as Sally stayed out). I was willing to trade it for the couch at my mom’s new place, but that was different. Now I was going to leave it for two weeks for the unknown? I sat on my bed with a pencil and my two journals. One was my worry journal. After my parents separated, I had trouble sleeping. Fears filled my head instead of dreams. My mother gave me a blank notebook and told me that whenever I have a worry, I should write it down. “Sometimes it helps to put your feelings to paper,” she said. “Troubles might seem smaller. Or, if they don’t, at least you’ve acknowledged them.” She had filled notebooks with writing, which I used to peek at sometimes. She wrote on and on about drudgery, some of it related to household chores (I had no idea what cruel and unusual punishment vacuuming was) and some of it related to my dad. Whenever I’d come across those entries, I snapped her notebook shut. I hadn’t liked thinking of our family as unhappy. Eventually my mom’s tight smiles and my dad’s sighs turned to shouting. I started writing down everything that scared me, from the news reports about Russian missiles to the spelling bee at school to my parents’ arguments. I think it helped, but I’ve also filled several notebooks. Looking at the pile of them in my closet always makes me sad—seeing just how many worries I’ve had to put to paper. And I’m sure some I forgot to write down. I’m kind of afraid to leave my house. What if I come back and Sally has overtaken it even more? What if she scratches up my Beatles album? Dad says Sally reminds him of me when I was her age. What if he decides he likes her better? What if my dad and Julie enjoy me being gone? What if my mother comes back and then leaves again and I miss seeing her altogether? What if my grandmother is strict and we do not get along? What if her new house starts to smell like old people? Every adventure has to start somewhere. I suppose that could include my grandmother’s retirement community. Rebecca Behrens lives and writes in New York City, where she also works as a textbook editor. She is the author of When Audrey Met Alice, which BookPage called “a terrific work of blended realistic and historical fiction,” Summer of Lost and Found, which Kirkus Reviews said “this blend of history with mystery and fantasy with realism is a good find indeed,” and The Last Grand Adventure. Some of Rebecca’s favorite things are: the beach, history, running, doughnuts, and laughing. Historical fiction lovers are in for a treat with this heartfelt tale of discovery and hope. Twelve-year-old Bea is living unhappily with her newly blended family after her parents’ divorce—young stepsister Sally particularly annoys her, and she misses her traveling reporter mother. Still, she’s nervous to spend several weeks with Pidge, her grandmother, about whom she knows little. 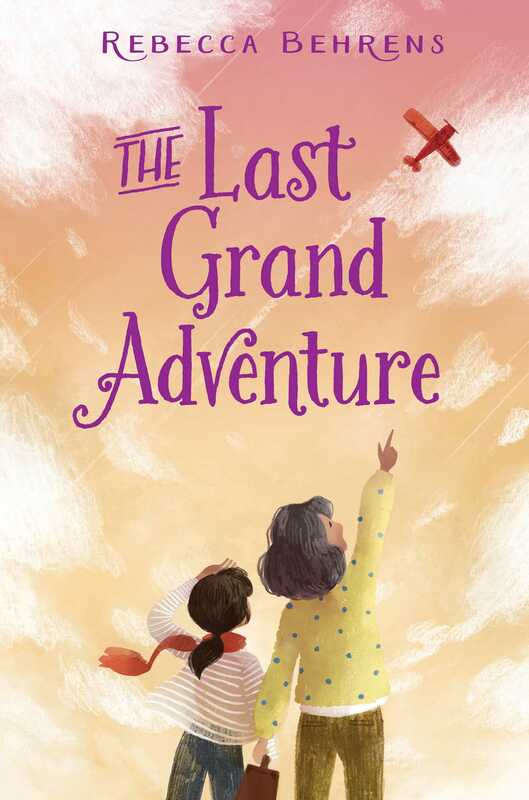 Despite warnings to be wary of unusual, forgetful behavior, Bea agrees to join Pidge on a secret, half-baked journey from California to her childhood home in Kansas in hopes to be reunited with her long-lost sister, Amelia Earhart. Pidge has been receiving mysterious letters from Meelie for decades and believes she is still alive. Bea, intrigued with the family mystery and warming to her grandmother’s quirks, supports her as they stow away, hitchhike, and take to the skies in a desperate attempt to reach Kansas—despite Bea’s nagging suspicion about the letters’ authenticity. This story has much to love, from the touching development of Bea and Pidge’s relationship to Bea conquering her fears and discovering the appeal of adventure. Bea even sees her stepsister in a new light as she witnesses the bond between Pidge and Meelie that transcends time and space. Young history buffs will appreciate the back matter, including a historical author’s note, selected bibliography, and list of which quotes in the book are authentic. VERDICT An excellent purchase for readers who enjoy a strong dose of adventure and solid character development in their historical fiction.